We all know how much we love parathas. And we also know that our conventional paranthas may not be very good on our health. But what if parathas could be made healthier? 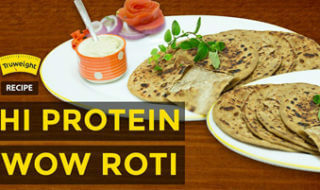 With the above recipe, you can have parathas and rotis that you always crave for, without hampering your body. Here two of our favorite superfoods are brought together to serve the best paranthas. The Hi-Protein Atta has 77% wheat and 23% gluten-free ingredients. It has more than 85% whole grains. And the Wow drink is a high protein, high fibre drink with chickpea, barley, amla, dry ginger, cumin and mint leaves! It is definitely where taste meets health. Take 2 cups of Hi-Protein Atta to a bowl and add a pinch of Ajwain seeds to it. Add water to the bowl as required and mix everything thoroughly to prepare the dough. Then take 2 sachets of Truweight Wow Drink in another bowl. To it, add 1 tsp of onion, 1 tsp of garlic paste,1/2 tsp of Green Chilli, 1 tsp of Coriander Leaves, 1 tsp of Amchur Powder, 1 tsp of Chilli Powder, 1 tsp of Lemon Juice and a pinch of salt and mix the entire thing. Now prepare a dough ball. And press it on the roti board to prepare the paratha as shown in the video. Then take 1 tsp of the Wow Drink Masala and put on the center of your paratha. Now bring together all the sides of the paratha and seal them tightly. Again prepare a dough ball and roll it on the roti board. You are now ready with healthy delicious parathas.